Have you ever had an experience so glorious that you relive it almost every day? However, when Tucker announced that a “Camel Beauty Contest” (The Al Dhafra festival) was being held in the desert during his stay, a turning point occurred. A camel beauty contest, seriously? New Ravenna might be going to hell in a hand-basket, but how in the world could I miss that? During the next few days we were shown shown all the sights of Abu Dhabi and Dubai (which is about an hour and a half by car from Abu Dhabi), then our gallant host Hussain drove us, at 247 kph (I’m not kidding), south into the desert. First stop, the oasis of Liwa, where his boss, H.E. Mohammed Khalaf Al Mazrouei, the Minister of Culture and Heritage, was raised. Abu (brother) Khalaf often refers to himself as a “simple Bedouin boy” (which is the equivalent of Warren Buffet saying “I’m just a simple country boy”). Liwa is just north of what is commonly known as the “empty quarter”–a swath of desert in eastern Saudi Arabia that is…completely empty. Apricot colored sand dunes stretch for hundreds of miles, south and east to Oman and Yemen just like in the movies. In fact, when describing his childhood Abu Khalaf likes to tell about the time when he was 14 and took his father’s jeep and drove across the empty quarter to Oman–and back–all the while neglecting to inform his parents of his plans.After seeing the desert through which he drove first hand, all I can say is that he should be happy that I was not his mother. If you want all your camels to follow you (to a camel festival, for instance), put a baby camel in the back of your truck. 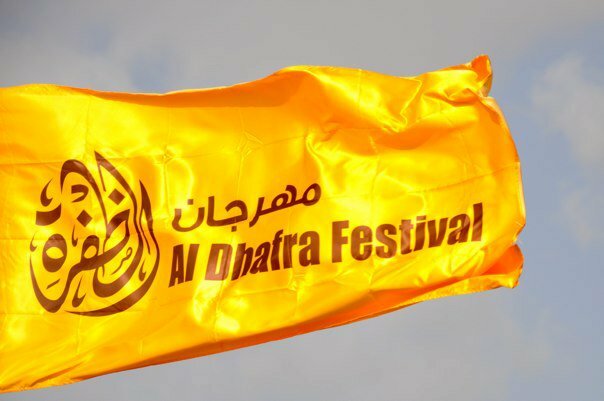 In any case, fast forward a few years and now, in another chapter of the “everyone thought we were crazy (crazy like a fox)” saga, visionary Abu Khalaf founded the Al Dhafra festival outside of his old stomping–I mean Four-Wheeling–grounds in Liwa. The goal was to celebrate and perpetuate the Bedouin culture and heritage, much of which is centered around camels. The first year, 20,000 camels showed up. Not being ones to ignore a good sign, they then planned and built a four star hotel on the grounds in eight months. Basically, our good-looking hosts were the Arabian versions of George Clooney (Abu Khalaf) and Brad Pitt (Abu Hussain)–it seemed we always had an entourage, everyone knew them and wanted to speak with them, and we felt like celebrities ourselves. Two kinds of camels are allowed to enter the competitions--black camels and tan camels. The black ones are for meat and milk, the tan ones for milk and riding. Bedouin encampments dot the horizon for miles around, but the main attractions are the 30,000 camels that arrive from all over the Middle East for the ” beauty contest”. Some of these camels are worth millions, will win millions, and you can get up close and personal with them on “Million Street”–the road on which all the buying and selling is occurring. Yours truly, walking down "Million Street"
This is a male camel who is really LOVING all the ladies...His daughters behind him are worth over 500k each. Yes, that is a gold lame' blanket. Other activities at the festival are: shopping at 180 souks selling Bedouin products, falconry demonstrations, date packaging contests, camel racing, and camel milking contests. Where to stay? We camped in tents along with our hosts, but check out the four-star hotel on the grounds, or this five star hotel (heavenly) about an hour away. The souk area--they've put woven matting over the surface of the sand--it's brilliant. We were some of the only Westerners I saw–the others were shooting a film for National Geographic. Everyone was unfailingly polite and seemed delighted to see us appreciating their culture–and there were many different Arab countries represented, not just the UAE. I also felt completely safe, in case anyone is wondering. Dave and I kept pinching ourselves, we were so thrilled…but the pictures prove it, we weren’t dreaming. Truly it was one of the most extraordinary experiences of my life. This particular camel is considered one of the most beautiful. Rumor has it she's not terribly fond of male camels...but she certainly seems to love her handler. The camel races are incredible! The owners follow alongside the racing camels in their SUV’s and talk to them through radio devices. When camels need prodding, they use a radio-controlled whip attached to the little doll/rider on their backs. This is a very young camel–still too small to be ridden by a real human. Yes...it's a speed bump sign. No kidding Soraya. It totally blew my mind. I hope to be going back again in December of 2011. Hi Kelly, the camels were all bathed and fluffy and friendly and truly…beautiful! It's fantastic to be immersed in another culture like this, if only for a few days. Wooh! I'm having fun with this article. It is very refreshing. By the way what's exactly the most beautiful camel looks like? Thanks for posting. I really enjoyed it. What a wonderful surprise this was! I was looking around for some news as to where Dave might be, and I wanted to look at your new designs. Then I saw the blog! This is fabulous and I am so excited for you all. What an experience! What wonderful hosts you had – this is amazing. So happy that you had this time! New Ravenna Mosaics founder and Creative Director, Owner, Sara Baldwin Design, Bass guitar player, Envisioner, Appreciator of the Sublime and Ridiculous.